The earliest known member of the family; married Eliza Davis May 16, 1816. Before leaving England one son was born to them—Edward I. Johnson, Feb. 14, 1817. Thisson enlisted in the Texan War of Independence, became lieutenant of artillery, and lost his life at the Alamo, in 1836, at the age of nineteen. Youngest child of David Israel Johnson; born Nov. 5, 1836; admitted to the Cincinnati bar in 1854, at the age of eighteen. He became prosecuting attorney of the police court of Cincinnati by appointment in 1857, and was elected to the office in 1859, serving one full term. Johnson was a member of the school board of Cincinnati from 1867 to 1871, and was mainly instrumental in bringing into the courts the famous controversy as to the reading of the Bible in the public schools, the controversy resulting in the discontinuance of the reading. In 1864 Johnson, with John P. Jackson and the Honorable George Hoadly, then a judge of the superior court of Cincinnati, formed a partnership under the name of "Hoadly, Jackson & Johnson." In 1877 Johnson and Hoadly went to New York city and associated themselves with Edward Lauterbach under the firm name of "Hoadly, Lauterbach & Johnson," which partnership continued until the death of Johnson on Dec. 8, 1893. In 1881 Johnson was nominated as lieutenant-governor of Ohio, but failed of election. 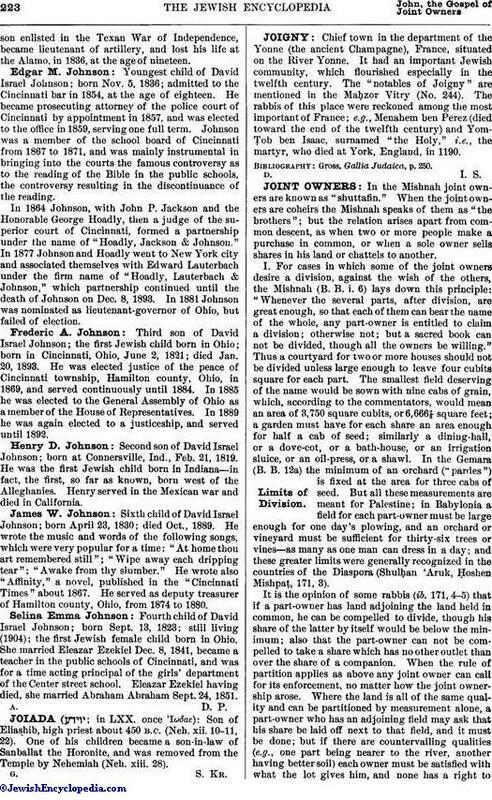 Third son of David Israel Johnson; the first Jewish child born in Ohio; born in Cincinnati, Ohio, June 2, 1821; died Jan. 20, 1893. He was elected justice of the peace of Cincinnati township, Hamilton county, Ohio, in 1869, and served continuously until 1884. In 1885 he was elected to the General Assembly of Ohio as a member of the House of Representatives. In 1889 he was again elected to a justiceship, and served until 1892. Second son of David Israel Johnson; born at Connersville, Ind., Feb. 21, 1819. 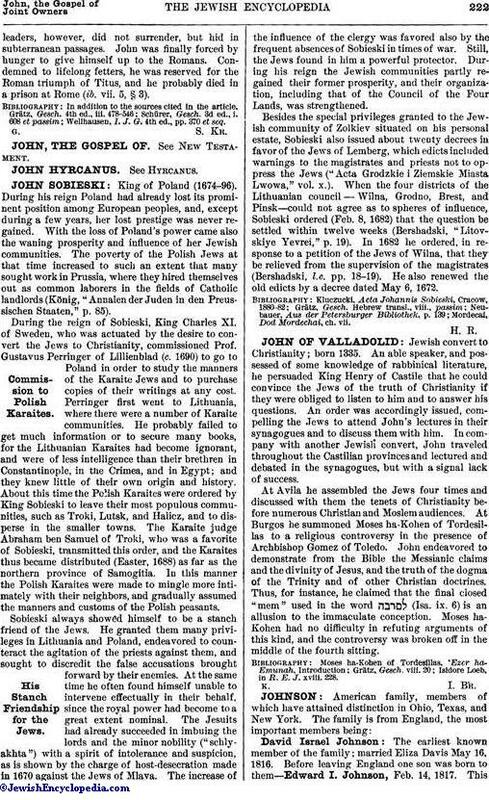 He was the first Jewish child born in Indiana—in fact, the first, so far as known, born west of the Alleghanies. Henry served in the Mexican war and died in California. Sixth child of David Israel Johnson; born April 23, 1830; died Oct., 1889. He wrote the music and words of the following songs, which were very popular for a time: "At home thou art remembered still"; "Wipe away each dripping tear"; "Awake from thy slumber." He wrote also "Affinity," a novel, published in the "Cincinnati Times" about 1867. He served as deputy treasurer of Hamilton county, Ohio, from 1874 to 1880. Fourth child of David Israel Johnson; born Sept. 13, 1823; still living (1904); the first Jewish female child born in Ohio. She married Eleazar Ezekiel Dec. 8, 1841, became a teacher in the public schools of Cincinnati, and was for a time acting principal of the girls' department of the Center street school. Eleazar Ezekiel having died, she married Abraham Abraham Sept. 24, 1851.